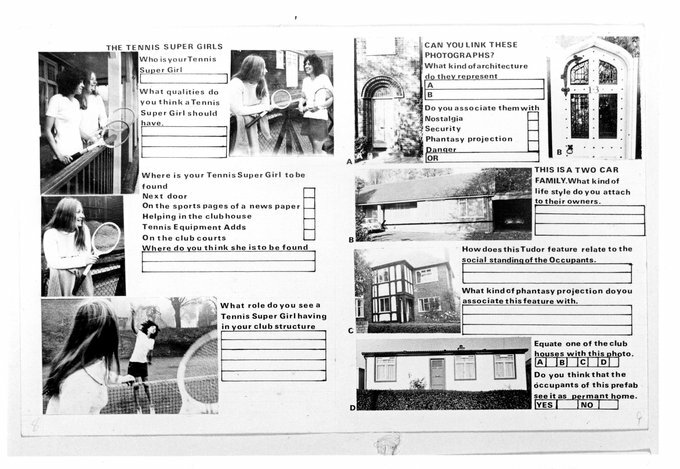 This was the first of Willats’ project works to employ the question and answer book format, which he went on to develop further in projects in Edinburgh and West London, and one of the first to both use imagery taken directly from the environment where the project was located and to actually site the work within that environment too. This use of familiar visual references and the importance of location were to become common element in his works and he saw these as essential methods of drawing in an audience that were not necessarily accustomed to art, describing it as an audience which is external to the art environment. It is further interesting to note the influence of advertising techniques on Willats at this time. 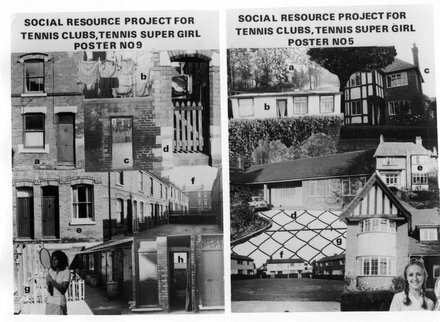 Tennis Super Girl Posters were part of the project and were to be used in conjunction with the I Spy Book of Tennis. There were nine posters in the series and each one depicted an aspect of the coding patterns associated with the environment of members of the four clubs. Posters were displayed in the neighbourhood of the clubs in a time-dependent sequence (a new poster was introduced each week and displayed for a month) that was based on advertising strategy. A poster was comprised of a collage of cues, and a participant in the project would use these as attention and motivational cues alongside the I Spy Book of Tennis to build connections between the contents of the posters, and as a result develop and formalize their own associations. There was also a Tennis Club Manual made up of visual data from the four tennis clubs and the home background of members. Questions were linked to cues, so that the first cue is an Umpire’s Chair and participants were asked to place a tick next to the word you associate with the photograph, the words listed being: Observer, Arbitrator, Teacher etc. The questions increased in complexity so that the last cue was just a picture of a scoreboard coupled with possible abstract associations such as: Performance Booster, Success Monitor. The project was then to have held a series of meetings to discuss the project and to formulate proposals for adapting the game of tennis around the information from the returns. The final part of the project was to have been a tennis tournament where members from the four tennis clubs would have played out their proposed re-modelled games of tennis.